Club: Brother Colm O’Connell Camp. Personal Best: 800m – 1:40.91 WR (London, 2012). As a small shy boy, David Lekuta Rudisha was inspired to run by his father, Daniel Rudisha, who won a silver medal at the 1968 Mexico Olympic Games as part of Kenya’s 4x400m relay team. His mother, Naomi, is a former 400m hurdler. Initially, Rudisha was a 400m runner, but his coach, Irishman, Colm O’Connell, prompted him to try 800m. In 2006, he became the World junior champion over that distance in Beijing, and two years later in 2008, he struck gold again at the African Championships in Addis Ababa. Ethiopia. By 2010, the power and speed of Rudisha, a member of the Maasai ethnic group in Kenya, was fully unleashed on the track world. On August 22, 2010, he broke Wilson Kipketer’s 800m world record – barely two days to the anniversary of that record that stood for almost 13 years – with a time of 1min, 41.09secs in Berlin. A week later, he lowered his own record at the Rieti Diamond League Meeting to 1:41.01. He also took gold for the second time at the Nairobi African Championships and became the youngest ever athlete to win the IAAF World Athlete of the Year award, as well as the Kenyan Sportsman of the Year award. In addition, he won gold at the Africa Continental Cup. Rudisha capped that string of successes with gold at the 2011 Daegu World Championships. 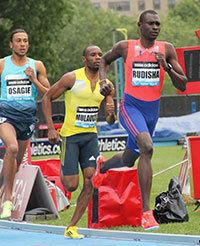 The following year, Rudisha put on a stunning performance at the 2012 adidas Grand Prix in New York City and had spectators on their feet with a US all-comers 800m record of 1min 41.74secs. He then booked his place on the London-bound Kenyan Olympic team for the first time with a win at that country’s national trials, running 1:42.12 minutes – the fastest ever recorded at altitude. But these were only dress rehearsals for the London show. Running in London without a rabbit to set the pace, Rudisha led from start to finish, winning gold in what was acclaimed “The Greatest 800m Race Ever.” He became the first runner to have broken the 1:41 barrier for 800m, the first person to win an Olympic 800m final with a world record since Cuba’s Alberto Juantorena in 1976, and the first reigning 800m world champion to win Olympic gold at that distance. His race splits were: 23.4secs for the first 200m, 25.88secs for the second, 25.02 for the third and 26.61 for the last.